House of Hope is on a mission to help stop recidivism via housing and support programs for men released from incarceration. House of Hope aims to be more than a transitional home or shelter for formerly incarcerated men. It will be a safe place that concentrates on helping transform men and aid them in regaining an independent, responsible lifestyle, thereby ending recidivism. Its focus is on assisting men in becoming who God called them to be while integrating them back into society. Currently there is no single program in Bloomington-Normal that provides formerly incarcerated men with housing and a program that offers training, mentorship and spiritual support. House of Hope is seeking to collaborate with local agencies to provide mental health assessment, drug and alcohol assessment, and education. House of Hope seeks to provide all of those services under one roof so that men can receive assistance with mental health, drug/alcohol abuse, time management, anger management, accountability and responsibility, employment and parenting skills. Pastor Eddie Perkins of Seeds of Hope Outreach is working to bring all of those services together for men who have been involved with the courts/criminal justice system. 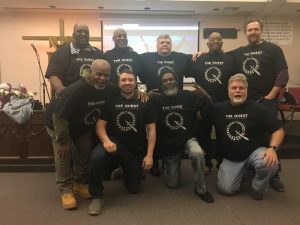 “We seek to provide one place for men to get all the help they need getting their lives back on track,” said Pastor Perkins. To learn more about programs currently helping this underserved population in Bloomington-Normal, visit Seeds of Hope's website or Facebook page. Please watch a video in which Pastor Perkins addresses the issue of recidivism. Illinois Prairie Community Foundation is acting a financial sponsor for House of Hope. If you would like to help make House of Hope a reality, please click the Donate below and make an online gift. If you prefer to make a donation in another manner, click here for information.